SOA composites as well as Service Bus projects typically consist of fair number of artifacts that hang together in ways that are sometimes not so easy to track down. Through import statements, hard coded references and other direct or indirect definitions, dependencies are registered between the many files that make up the application. From BPEL component to WSDL to XSD to other XSD is a not too uncommon path. However, for developers it can be quite a challenge to get a good grasp on these dependency paths. Inspired by – and perhaps more than just inspired – the App XRay feature in OEPE (Eclipse), JDeveloper 12c ships with the Dependency Explorer. This is a tool that can be set upon almost any artifact in SOA composites or Service Bus projects. It will leverage all its built in knowledge about potential dependencies and it will visualize these dependencies. 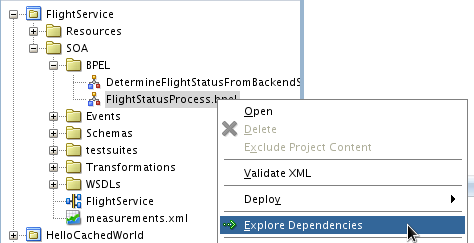 In the Dependency Explorer itself, we can right click all components listed and drill further down, list the reference details, select the component in the navigator or bring up the editor for the component. Here is the drilled down overview of dependencies, starting from the WSDL document ProxyService.wsdl and backtracking what are the references to the WSDL document. 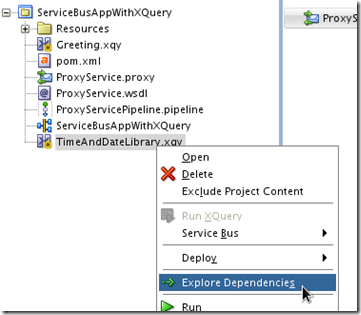 In a previous article, we introduced the SOA Suite 12c support for XQuery library modules. This overview tells us that we will indirectly impact the ProxyService if we do something wrong with the TimeAndDateLibrary.xqy. This article discusses how to implement an asynchronous web service in Java EE. The Java application will expose a one way operation that will process the request and send a response message to a callback Web Service interface that is indicated in the request header through WS Addressing properties (messageID, replyToAddress). The Asynchronous Web Service is subsequently deployed and invoked from SoapUI. When the implementation is thus complete, we create a new project in SoapUI. In this project, we will create a test request to invoke the ThoughtfulGreeter service. We will also create a MockService in SoapUI to act as the callback interface ThoughfulGreeterCallback. In the request from SoapUI to the ThoughtfulGreeter service, we will specify WS-Addressing properties that refer to the MockService. Finally, when we have SoapUI make the call to the ThoughtfulGreeter service, we will receive a call (back) to the MockService, containing the response. How to import a Visio BPM process model in BPM Suite?